Prep Time: 2 hr. 20 min. Total: 2 hr. 28 min. 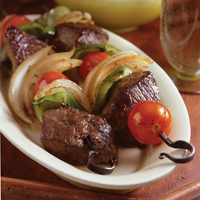 In each kebab, the lean beef provides protein to help make you feel full, and the onions, green peppers, and tomatoes delivers healthy fiber. With a sharp knife, cut the sirloin into twenty 1" cubes and place in a bowl. In a separate bowl, combine the ginger, garlic, soy sauce, Worcestershire sauce, oregano, cumin, and oil. Add the mixture to the beef and stir well to coat. Cover the bowl and refrigerate for 2 hours or overnight. Preheat the broiler and coat a broiler-pan rack with cooking spray. Alternately thread 5 beef cubes, 4 onion pieces, 4 bell pepper squares, and 3 cherry tomatoes onto each of four 18" wooden or metal skewers. Place the skewers onto the broiler pan and sprinkle with the salt. Broil 4" from the heat source for 8 to 10 minutes, turning them every 2 minutes, until the vegetables are tender and the beef is cooked through. Copyright © 2005 by Rodale Inc.